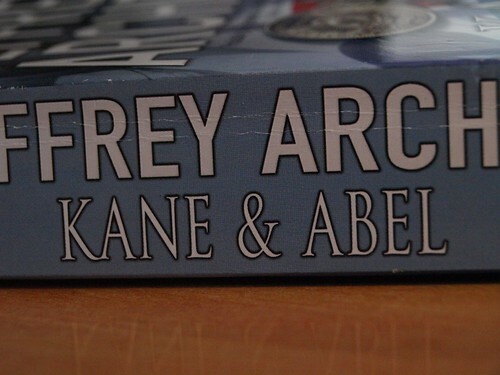 Kane and Abel , originally uploaded by Thoroughly Good. Painfully aware as I am that the Proms season is rapidly coming to an end, my attention has turned to finding things to occupy the time left when those nightly concerts come to an end. As I’m also feeling quite chuffed that I’ve got to the end of an 8 week period and remained committed to the cause without flinching both in terms of listening and writing, I figured I needed a similar challenge to sink my teeth into. Reading the odd book seemed like the best route to take. After all, if my mind has been broadened listening to music I would otherwise dismiss at a moments notice, could I achieve the same reading books? It’s hardly earth shattering stuff, is it? Reading. Everyone does it. I have a bit of a problem with reading, however. I’ve lost count of the number of books I’ve started only to get distracted mid-way through. The book is cast-aside. Suddenly the appeal it had is lost. The book is abandoned. The TV gets switched on. I don’t normally have the problem when I’m holiday. In fact, I’ll power through two or three books on holiday and return from my trip filled with a smug sense of self-satisfaction, accompanied with a new resolve to get reading more. I can never manage to keep it up. In recent weeks however, I’ve noticed a change. Ahead of my 12 day holiday to Turkey later this month, I’ve embarked on a bit of pre-holiday training. All this really means is indulging in a bit of pre-holiday activities like going out for meals, going to the cinema, shopping, packing bags or this year – as it seems – getting some reading in early. Here’s the shocker, however. I figured I’d set the bar low. Baby steps first of all. What I’m after here is that sense of achievement before I go on holiday. I want to have read a book before I go on holiday so that I can capitalise on it when I’m sunning myself by the pool. How far did I set the bar? All the way down as low as Jeffery Archer’s Kane and Abel. I know. Awful isn’t it. Me having a degree qualification as well .. in the arts (just to make things even worse). So, should be you be interested in tracking my progress, then be sure to come back to the Books category on the Thoroughly Good Blog.